The Houston Area Tougaloo College Alumni Chapter celebrated its 26th Annual A Night of Jazz event on Saturday, August 4th at the Houston Marriott West Loop in the Galleria area. This is the Chapter’s annual signature event to raise money for the College. 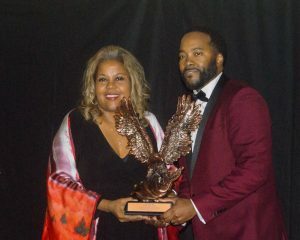 This year, the Chapter was privileged to award its prestigious Soaring Eagle Award to Sybil Wilkes, co-host of the nationally acclaimed Tom Joyner Morning Show. Ms. Wilkes told the audience that if it had not been for Tougaloo she might not be where she is today. She says her grandfather, Dr. Sherman Scruggs was hired for a teaching assignment at Tougaloo. At the time, he was engaged to a young woman in Kansas; however, when he got to Tougaloo, he met a young student, Annie Mae Woolfolk from Yazoo City. Dr. Scruggs returned to Kansas, broke off the engagement and went back to Mississippi to ask for Annie Mae’s hand in marriage. Ms. Wilkes fondly remembers her annual summer vacations visiting her relatives in Mississippi and hearing about Tougaloo College. It was truly a touching story. The award was presented to Ms. Wilkes by Chapter President Hosea R. James. scholarship. Many thanks to Dawana Gholar Taylor for chairing the ANOJ Scholarship Committee. The Chapter was also honored to award its first ever President’s Award to Tougaloo College President, Dr. Beverly Hogan for her lifetime commitment and service to the College. 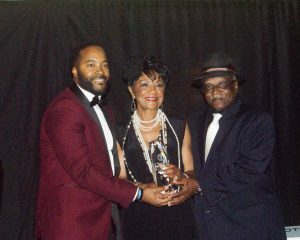 Dr. Delores Stamps, Vice President of the Office of Institutional Advancement accepted the award in Dr. Hogan’s absence. Adding to the festivities of this year’s event was the Harlem Nights/Roaring 20s theme which the ANOJ guests fully embraced. The women were decked out in their shimmied dresses, long pearls, boas, and head bands, while the men were dapper in their colorful suits and chained pocket watches. The crowd of about 200 guests enjoyed a fun-filled evening with friends that included food, libations and listening to the smooth jazz sounds of Joe Carmouche and his band. Guests also had the opportunity to bid on a nice selection of silent auction items. Also in attendance from the College was the Director of Alumni Affairs, Ms. Doris Bridgeman. Chapter charter member, Leroy Hayes is to be commended for personally inviting about 15 young alumni members to attend the event. He also very graciously purchased their tickets. The Night of Jazz is held annually during Jazz Month in Houston, Texas. It has become an event that friends and alumni of Tougaloo College look forward to every year. The outstanding success of this year’s event can be attributed to teamwork and the leadership of ANOJ Co-Chairs, Kortney and Hosea R. James.